This post contains some affiliate links, please see my full Disclosure Policy here. Harvey Karp, MD, is a nationally celebrated pediatrician, child development specialist, and children’s environmental health advocate. He is on the faculty of the USC School of Medicine and a fellow of the American Academy of Pediatrics. Dr. Karp’s books and DVD’s, The Happiest Baby on the Block, The Happiest Toddler on the Block, and The Happiest Baby Guide to Great Sleep, teach parents breakthrough techniques to reduce infant crying, boost sleep, build toddler patience, and stop tantrums. The enormous popularity of Dr. Karp’s work has made him one of the most read — and most trusted — pediatricians in history. Finally, kids do come with instructions! Surprisingly simple steps to boost your little child’s sleep fast! Dr. Harvey Karp made doctors applaud and parents cheer with his brilliant solutions to centuries-old problems such as colic and tantrums. Dr. Karp stuns the world again by solving the #1 problem plaguing new parents: exhaustion. How to train brand new babies to sleep better: Infants can be taught to sleep at least one extra hour from the first weeks of life! Dr. Karp shows how to safely boost baby sleep in just days. Why parents should always wake a sleeping baby: For good sleep, babies must learn how to self-soothe. The best way to teach babies how to fall back to sleep—when they rouse in the middle of the night—is to wake them just as they’re being put into bed. How to enjoy the benefits – and avoid the risks – of swaddling: Swaddling dramatically improves a new baby’s sleep. Yet, many states are shockingly banning this ancient parenting tool. Smart moms should do it and Dr. Karp will teach them how to do it properly and safely. The importance of powering down: Staring at bright screens at night (TVs, computers, phones) can wreak a toddler and a parent’s sleep. Easy “no-cry” tips that end infant and toddler bedtime struggles in just days! With The Happiest Baby Guide to Great Sleep, no longer will new parent have to suffer months of sleep deprivation and no longer will babies have to cry themselves to sleep. Backed by compelling science, common sense and decades of experience, Dr. Karp’s landmark guide will revolutionize how millions of children drift off to dreamland. Oh sleep, sweet sleep…. if you have been hanging out with us for any length of time, you probably have heard my laments about my sweet little guys lack of sleep. In the 15 months since he was born, neither of us have had more than 3 hours of sleep at a time. We are a nursing-on-demand family and he is sure demanding!! I have tried SO many different trick and tips from well-meaning family and friends to try to get him to sleep through the night (oh, who am I kidding… I would take just 5 hours at this time), but to no avail. We have never been comfortable with the “cry it out ” method- it just doesn’t work for us. 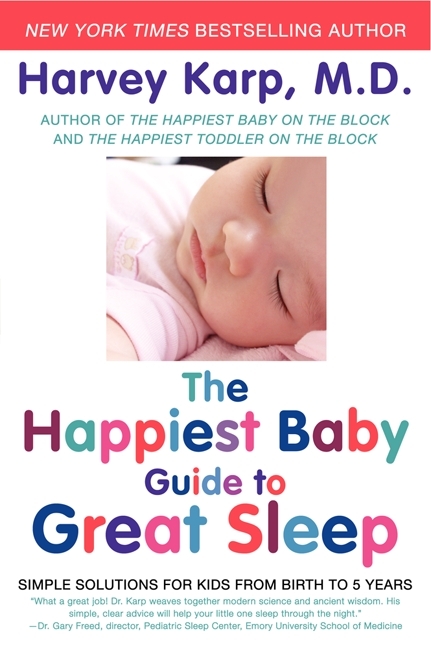 So… when I heard about The Happiest Baby Guide to Great Sleep- I was intrigued. I have read Dr. Karp’s other book- The Happiest Baby on the Block, and I loved so many of the tips he offers for creating a happy baby. When the book arrived, I was hopeful that sleep might once again enter our household…(fingers crossed)!! I decided to flip right to the toddler section and read away. There are four chapters in this section and they include information on creating good sleep plans, transitioning from crib to bed, the importance of bedtime routines, problems that can keep your child from sleeping well, and so much more. I got so many great ideas from this section and although Dr. Karp does refer to the “cry it out” method, there are many other alternatives offered as solutions to the basic sleeping problems. The first thing we did was begin a very structured bedtime routine- the first few nights there was no change, but within the week we began to see an improvement in his sleep patterns. Around this time we also started introducing essential oils into the mix and between those and Dr. Karp’s suggestions, I can say that our sleep issues have decreased and we have slept for 5-6 hours several nights in a row. Success!! experience. Any help wuld be greatly appreciated! I am extremely impressed together with your writing talents aas smartly as with thhe structure to your weblog. way keep up the nice quality writing, it’s rare too see a great blog like this one today..
page and now this time I am visiting this website and reading very informative articles or reviews at this place. from those World Health Organization birth bought the products earlier. way through which they arse be utile to you as the business sector owner and your sensed customers. can go viral easily, you need some initial traffic only.